Manuela Ungureanu, associate professor of philosophy, Carlos Teixiera, associate professor of geography, and 20 students will be heading to Romania and Bulgaria next month for six weeks of study. A group of UBC students will be heading off campus to advance their education – way off campus. The 20 students and two faculty members will head to Romania and Bulgaria in mid-May to spend six weeks studying various issues and interacting with local residents. 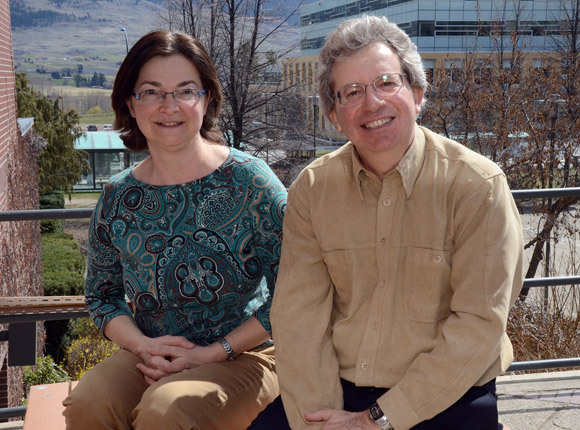 Carlos Teixeira, associate professor of geography, and Manuela Ungureanu, associate professor of philosophy, will lead the contingent of 15 Okanagan campus students and five students from UBC's Vancouver campus. For Ungureanu the trip will be a homecoming of sorts as she was born in Romania and graduated from the University of Bucharest in 1986. She grew up under the iron fist of Communist leader Nicolae Ceausecu and moved to Canada in 1992, after the fall of communism. Ungureanu is excited to be teaching courses in social and political philosophy with special focus on freedom of expression. “I will finally be teaching what I wanted to be taught,” she says. Of course, under strict communist rule neither course was allowed, but now the country is in a state of transition and such educational and academic freedoms are available. “I think I will learn a lot from the students as well from their expectations concerning democratic institutions they take for granted at home but need generations to establish,” she says. Teixeira, who specializes in the study of communities and urban centres, will take the students to some of the most densely populated and poorest neighbourhoods in the two former Soviet Bloc countries. Teixeira’s teaching will be done in the community where he will encourage the students to think critically about housing, barriers to housing, housing policies and other issues. The excursion has been organized under the Go Global Group Study Program. Ungureanu said the group study aspect of the trip will also be a learning experience for the students, who more and more are studying by themselves. “There is something they can learn from each other when they group study,” says Ungureanu, adding group studies afford students the opportunity to bounce ideas off each other, ask questions and open avenues of discussion they may not have taken while studying alone. Dana Lowton, Go Global coordinator for UBC's Okanagan campus, says there are more trips planned that students and faculty can take advantage of. Lowton says this is the first group study program based at UBC's Okanagan campus. For more information on Go Global, go to http://www.ubc.ca/okanagan/students/global.